Officers, 1st Battalion, King's Own Royal Regiment, Bulford, 1951. Rear row, left to right: 2nd Lieutenant Aslett; Lieutenant K G Cain; 2nd Lieutenant W B Moralee; 2nd Lieutenant A C Booth; 2nd Lieutenant J A Thompson; 2nd Lieutenant E H Cowper; 2nd Lieutenant J A Stannard. Centre row, left to right: Captain M Foster; Captain A J Stead; 2nd Lieutenant S M Houghton; Lieutenant C M Hilton; Lieutenant P V Roberts; 2nd Lieutenant M M Barrett, Lieutenant D A Barrett, 2nd Lieutenant E J Foxall, Captain M Smalley, Seated, left to right: Captain S Blezard; Captain & Adjutant Derek Dunand; Major H T Roberts, Major T E Jakeman, Major J E Rhodes, Brigadier J H Hardy CBE MC, Lieutenant Colonel W M W Cooper; Major (Quartermaster) G W Bone, Major D G Clayton, Major Nigel St. G. Gribbon and Captain L E Nash. Warrant Officers and Sergeants, 1st Battalion, King's Own Royal Regiment, Bulford, 1951. Third row, left to right: Sergeants Banks; Brown; Cooper (RAEC); MacMahon; Band Sergeant Bainbridge; Sergeants Gornall; Hunt; Jolly; Oldham; Mullens; Atkinson; Foden; R Taylor; Rowlands; Moran. Second row, left to right: Sergeants Sharples; Shaw; Treen; Taylor; Maloney; Tanner (Army Catering Corps); Colour Sergeants J Allen; J Burden; A Smith; T Hurley; T Crook; Sergeants Charnley; Driver; Emmerson, Foster and Whitcombe. Front row, left to right: Staff Sergeant W Wyre; Company Sergeant Major G Hull; Orderly Room Quartermaster Sergeant R H Lindsay; Company Sergeant Major H Larmour MM; Major G Bone (Quartermaster); Regimental Quartermaster Sergeant G Taft; Regimental Sergeant Major L Coblenz; Brigadier J H Hardy CBE MC, Colonel of the Regiment; Lieutenant Colonel W M W Cooper (Commanding Officer); Bandmaster Morley ARAM; Captain Derek E Dunand (Adjutant); Company Sergeant Major G Fitzpatrick; Company Sergeant Major J Brickell; Company Sergeant Major Joe Heath; Drum Major J Herbert. 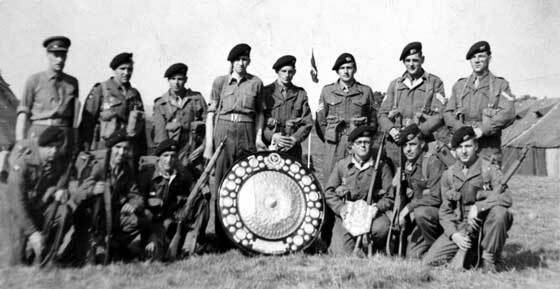 Shooting Team, 'D' Company, 1st Battalion, King's Own Royal Regiment, Bulford, 1951.